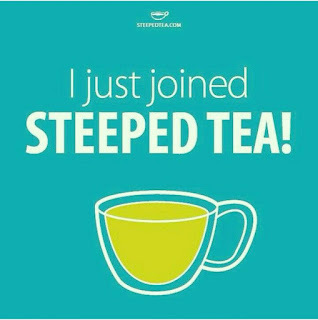 The Buzz: I Just Joined Steeped Tea! I Just Joined Steeped Tea! Hello Friends! Happy Monday to ya! I am just buzzin' in to tell you about my newest business venture. Many of you know that I used to own a Tea Room many moons ago. And even though I love my morning coffee, and my hot chocolate during the Winter months, my afternoon belongs to tea. There's just nothing that relaxes me more at the end of a long day, than a nice hot cuppa tea. Recently, I viewed a Periscope where my friend was un-boxing all of her Steeped Tea goodies. I was mesmerized by all of the things she pulled out of those boxes. So much so, that after the 'Scope was finished, I searched online and found Steeped Tea. I looked for a consultant in my area and guess what? There wasn't one. Sooo...I decided to fix that and I signed right up! My Steeped Tea website is up and running and I would love for you all to take a look at it. There are soooo many goodies there. I am looking forward to sampling different teas, trying some of the tasty tidbits and using some of the accessories they offer to have tea parties with my family and friends. This is going to be so much fun! 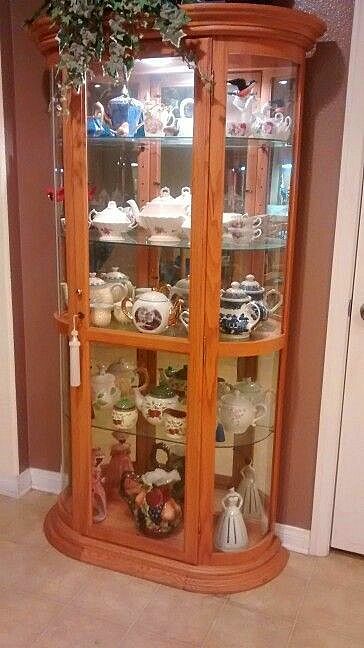 This corner cabinet is in our dining room. Mostly tea cups with saucers here. At the bottom is my antique chocolate pot. It looks like a miniature coffee pot, to match the coffee and tea service, but was used for hot chocolate. Many of my teacups were passed down to me from various family members. Several of the cups are as old as I am, some are older. At one time, I used all of these. Either in the Tea Room or just for Afternoon Tea with my husband and our daughters. This bookshelf is at the end of one of our hallways. The little teapot lamp was a gift from a dear friend. The wicker basket on the right, has a Chinese tea service inside...2 cups and a tea pot; purchased in China. This belonged to my grandfather. 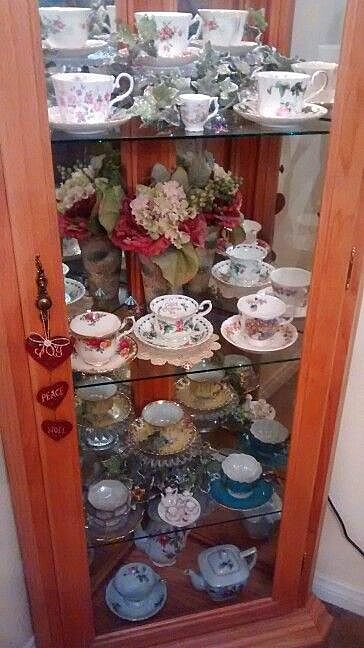 You'll notice the cups laying on their sides...I display them this way so that one can see the beautiful detail on the inside. And this cabinet is in our kitchen. I've displayed mostly tea pots here. The ladies on the bottom shelf were my grandmother's. They were for napkins. The cloth napkins, which is all my grandmother used, were put into the slits and then it looked like the ladies had on dresses. My grandmother was very big on entertaining. She was a coffee drinker though...and she always used a cup with a saucer. I inherited my love of tea from my grandfather. This is just a small part of my collection. I have an entire closet with boxes stacked floor to ceiling with more tea items. Funny thing...I kept planning to sell, gift and donate many of my things but, I never got around to it. Now I'm glad I didn't! And just the other day, my oldest daughter told me how much she wanted some of my scones and cream. Well, looks like I need to pull out my recipes, dust off my baking sheets, wash a few tea pots and put the kettle on! It's time for Tea with B.! Thank you so much for joining me today. I hope you have an awesome week! Labels: chatter, Steeped Tea, Time for Tea with B. How exciting for you, Barb! I know how you love your tea and this seems to be a wonderful fit for you. I hope you have lots of success with this venture. You are going to be one busy lady in 2016, but that's not a bad thing. Loved seeing your photos of all your beautiful tea accoutrements. Have fun!! Oh, Barb, how exciting! I'm a tea drinker myself and never really have loved coffee. And I love the beauty of having tea and have my own small collection of teacups and some teapots. Many of the items I have are passed down too, and I cherish them and also love to see the insides of cups. Years ago the insides were such a delight as one would sip down and see the bottom and smile. I wish you much success and joy on this new venture. I just wish we lived close by to have some tea. A number of my dear friends from church and I have been to several tea shops where they serve high tea, and we had such fun. One was so beautifully decorated with antiques and also had lovely hats that everyone would get to chose and wear, and of course, we always dressed up too. And I am blessed to have a friend who hosts an annual Christmas Tea each year just before Christmas. And last December she told me it was her seventeenth one...and I was the only one who had not missed a single year. Each year during the summer she tests recipes and takes great care in choosing a menu. And then her dear elderly mom makes lovely gifts as take-homes, and there is a theme that she surprises us with each year. And after our tea time, we gather in her living room and watch her open the gifts we give her as a thank-you for hosting the tea. Obviously, it takes by time and expense to do each year, and we love her dearly. We are mostly members from our choir years ago. What a blessing, and I know your teas must have and will continue to be a blessing to many! Hugs, sweet friend!